Today, we get to the fun stuff. 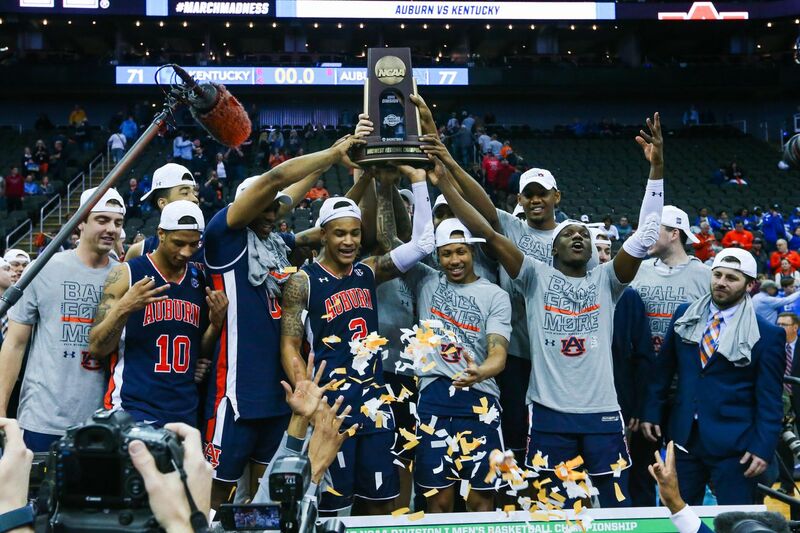 After Auburn won their final 4 regular season games, rolled through the SEC Tournament, and survived the first 2 rounds of the NCAA Tournament, the Tigers found themselves in Kansas City for the Sweet 16 against the top seed in the Midwest Region, the North Carolina Tar Heels. At this point, Auburn was considered the bracket busters as chalk mostly played out in the bracket. All 4 1, 2 and 3 seeds made it to the Sweet 16. There were 2 4 seeds, and then Oregon and Auburn. At this point, Auburn was essentially playing with house money. This was one of the most exciting matchups amongst the Sweet 16 slate because of the fast tempo offense that each team ran. Carolina also came into the game as the 3rd highest scoring team in the country averaging around 86 points a game. The point guard matchup of Jared Harper vs. Coby White was going to be one of the fun matchups to watch in this game. The game started out as we anticipated as both teams got up and down the floor and put points on the board. Throughout the first half of the game, neither team led by more than 5 points. Auburn got big contributions from Chuma Okeke, Malik Dunbar and J’Von McCormick. A lot of the conversation pregame was containing Bryce Brown and Jared Harper. I think UNC forgot about trying to stop Okeke. He led Auburn with 12 points and 6 rebounds in the first half. One of the biggest concerns going in for Auburn was rebounding. Despite this, Auburn held their own on the boards against the Tar Heels. Dunbar was a big part of Auburn’s offense early scoring 8 early points in the first half. With 7 minutes, McCormick took over at the point guard spot after Jared Harper picked up his 2nd foul. He made 3 layups in the final 3 minutes of the half including 2 on the last 2 possessions of the half. McCormick had all 10 of his points in the 1st half as Auburn led 41-39 at halftime. This despite Bryce Brown going scoreless and Harper scoring only 2 points. The 2nd half started off beautifully. Harper made a 3 and then Bryce made a 3 too. Next thing you know, Auburn is up double figures on North Carolina and is this really happening? Carolina made a run to cut the lead down to 7 when Auburn began a block party. Austin Wiley absolutely stuffed Nassir Little at the rim. A minute later, Chuma joined the block party. After the under 12 timeout, Auburn hit 4 straight 3s, 3 by Danjel Purifoy who waited all year for a moment like this and then McLemore called bank on his and suddenly, Auburn was up 19. Everything was going right. This was the most fun I had watching an Auburn Basketball game on TV. Until it wasn’t. Meanwhile, Chuma had continued to establish his will on both sides of the court scoring in a variety of ways in the 2nd half. He would end up with 20 points and 11 rebounds and was well on his way to a career night until..... the injury. Not again, Auburn had a devastating injury to go endure last year. This couldn’t be happening again. It didn’t look good and everybody knew it. Auburn was up 14 at this point and as much fun as this game was to watch, it wasn’t so fun anymore. Everyone’s concern was for Chuma. And that was the birth of the #DoItForChuma campaign. On the first possession after the injury, Carolina came down, missed a 3 and Auburn looked sluggish going for the rebound. Carolina got to the loose ball and hit a 3 and I thought oh no, this is NOT how this is going to end. No way these guys are going to go out like this. They responded. Horace Spencer scored on the other end, Purifoy would hit 1 more 3 and Bryce Brown would slam the door with a 3 and a steal/breakaway dunk to send Carolina home. The walk-ons got in for the 2nd straight game and lo and behold, Myles Parker got in on the 3-point party. Auburn made 17 3s and soundly defeated one of the best teams in the country. They were going to the Elite 8 for the 2nd time in program history. Malik scored 13, Bryce ended up with 12 points, as did Purifoy. McCormick scored 10, as did Samir Doughty, who we’ll talk about more in the next game. Harper while scoring just 9, dished out 11 assists. Everything was great, except it wasn’t. Everyone was worried about Chuma. People have said a LOT of really bad things about Bruce Pearl. Sure, he’s made mistakes in his life but haven’t we all? This postgame interview speaks volumes to how much Bruce cares about his players and the type of person he is. And if you think these weren’t real emotions (and trust me, I saw people saying this), then something’s wrong with you. Toomer’s Corner was amped up but honestly a bit more subdued compared to the Kansas win knowing that it was likely that Auburn would have to keep playing without Chuma. How would Auburn respond playing without him. Knowing who was next up for Auburn made me and every Auburn fan rightfully nervous as it was one of the 2 or 3 teams I wanted no part of in this NCAA Tournament. Kentucky was fortunate to win their game against Houston. An Auburn-Houston game would have been another game of interesting styles of play. But in order to be the best, you have to beat the best. Kentucky, as we’ve well-documented was a bad matchup for Auburn. P.J. Washington was going to have his way in the paint against Auburn, and he did. Tyler Herro had played lights out against Auburn in the regular season, especially shooting the 3. They had destroyed Auburn 80-53 back on February 23rd and as we talked about at the beginning of this series, things didn’t look great for Auburn at that time. But this was different: now, Auburn was 1 of 8 teams left playing for a National Championship. Kentucky had their full complement of players for this matchup and were rightfully favored. For the first time since the New Mexico State game, I was nervous. This right before the game however gave me and the entire Auburn fanbase life. It was clear what the motivation was for Auburn: Do It For Chuma! Things did not start well for Auburn. It took 3 1⁄2 minutes for Auburn to get on the board and they did that when Danjel came in off the bench to hit a 3. His play was going to have to elevate if Auburn was going to have a chance in this game. Austin Wiley came in and gave Auburn some good minutes as he scored the next 2 baskets. But Kentucky was in control of the paint and then Tyler Herro hit a 3 to put the Cats up 17-7. Things didn’t look great. But that was Herro’s first and ONLY 3 of that game. I said earlier we were going to talk about Samir Doughty and he is one of several players on this team that never got the credit he deserved. Doughty would always find a way to hit a big shot or two in a game and played tremendous defense. His defense on Herro was outstanding and Herro had one of his worst games of the year, scoring only 7 points on 3-11 shooting (1-5 from 3). Bryce Brown was finding ways to score though to try and keep Auburn in it. He got to the free throw line, he was driving to the paint and made his first 3 with 7 minutes left in the half. Still, Auburn couldn’t keep up with Kentucky and the Cats had a 10 point lead at the Under 4 timeout. What happened next was one of the key parts of the game. This Jared Harper 3, plus the foul, drew Auburn within 6 points and over the next 1:30, Auburn cut a 10 point deficit down to 3. This McLemore putback dunk cut the lead down to 2 late in the first half. Despite being ice cold from the field for stretches of the 1st half, Auburn found themselves down only 5 at halftime. I liked where Auburn was sitting. In the 2nd half, Bryce Brown came out on a mission. Following a transition 3, Brown was fouled from 3 down 2. He made the first 2 but missed the 3rd. Washington got the ball for Kentucky but Brown intercepted the pass and did this. Auburn fans started believing. Auburn was believing and around this point, Chuma Okeke had made his way to the Sprint Center. This allowed Auburn to believe even more that this was possible. The block was incredible. The stare that followed was freaking legendary. The game remained close throughout the 2nd half and Auburn got up 6 with 7:10 left. But Kentucky was going away and Auburn’s shots stopped falling. Bryce Brown, when not making 3s, made some tough jumpers that showed just how far his game has come in his 4 years on the Plains. P.J. Washington, who scored 28 in this game, scored with a minute left to put Kentucky up 2. Jared Harper came back and scored to tie the game at 60. Then, Auburn came down and put together their best defensive sequence of the year. 2 blocks and a chance to win the game. It was supposed to be either Bryce or Jared taking the last shot. Instead it was Horace Spencer. He was open but that’s not what Bruce Pearl or Bryce Brown wanted there. Still, if Spencer makes that shot, that would have been the greatest shot in Auburn history hands down. So we go to Overtime. Auburn had Jared Harper. Kentucky did not. When Jared didn’t score in overtime, he made an incredible pass to Anfernee McLemore who watched the ball go around the rim before finally going in. Harper had 12 of his 26 in overtime. He scored or assisted on 14 of Auburn’s 17 overtime points. Build that man a statue! In the end, Auburn made free throws, a final defensive stand and holy crap, Auburn did the darn thing! The scenes from Kansas City were incredible. So were the scenes in Auburn. It was just as good as beating Alabama in football. To me, it was better. Auburn was going to Minneapolis and the Final Four! At the time, it was hard to put into words what we had witnessed. It still kind of is, but it’s awesome to remember! 12 straight wins, 3 straight over the 3 winningest teams in College Basketball history. With the win over Kentucky, Auburn Basketball was going to be playing on the biggest stage in College Basketball! And they did it in one of the most unlikely ways possible: they beat Kansas, North Carolina and Kentucky, back-to-back-to-back. That hadn’t ever been done before. It’s just another example of Auburn making history. Looking back, I wouldn’t have wanted it to happen any other way. They #DidItForChuma. We’ll put a bow on this series and the season in the finale of this series tomorrow as we look at Auburn’s Final Four game against Virginia. Until then, War Eagle!